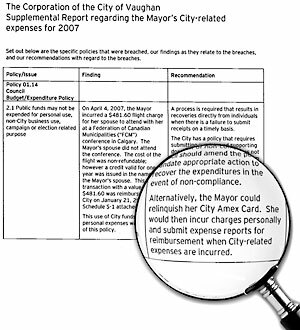 Embattled Mayor Linda Jackson breached city spending policies and should be on the hook for thousands of dollars in misspent funds, say the authors of a $40,000-audit report delving into her 2007 office expenses. In a supplemental report by accounting firm Ernst & Young presented to the city’s audit and operational review committee Monday, the auditors conclude Jackson claimed more than $3,300 in cellphone bills and $1,000 in business meals without supporting documentation. “Council should require repayments of the (cellphone) amounts by the mayor to the city if the mayor fails to provide supporting documentation in a reasonable period of time,” the audit report states. As for the $1,000 in business meals, which Jackson paid for with her corporate Amex credit card, the auditors recommend council change its expense policy to give it the power to “recover the expenditures in the event of non-compliance”. In several places, the report suggests the mayor should either curb her use of or simply give up using her city Amex card. Instead, the auditors write, Jackson could be asked to pay out of pocket for any expenses before submitting her receipts for reimbursement. The same goes for more than $1,000 in expenses charged by the mayor to her city Amex card while on York Region business, money the auditors say should be repaid to the city. Taking the mayor’s corporate credit card away is a step too far, said Councillor Sandra Yeung Racco, a member of the audit and operational review committee. “We’re just like a private corporation entity, just like an IBM or any of them,” she said Tuesday. “Do we really say to our CEO and our executives, ‘Hey, guys, no corporate cards for you’? It makes no sense. Jackson will reply to the auditors’ findings in a report she plans to file with council on June 15 and will not be making any further comment until then, she said in an email Wednesday. Other recommendations made by the auditors include taking steps to tighten city policies related to alcohol consumption at business meetings and attendance of spouses at city functions, among other things. The audit and operational review committee approved the recommendations, but asked city staff to clarify points raised at Monday’s meeting, committee chair and Regional Councillor Gino Rosati said Tuesday. The original audit report was delivered to the audit and operational review committee in December, but was deemed incomplete by councillors, who asked Ernst & Young to have another crack at it. The release of the supplemental report comes amid a growing call by residents to have all council members’ office expenses audited. “We do have an expense policy that we expect everyone to adhere to,” Rosati said. “And that applies to all of us, whether it’s the mayor, councillors or what have you.